"The World Has Enough Superheroes". That's not our opinion, mind. Rather, it's literally the slogan for Venom, right there up on the posters. After watching the film, one wonders if it wasn't actually a studio note placed on the banners by accident. It's true, Venom is more antihero than superhero, but given he is still part of the wider Marvel universe (a Spider-Man spinoff owned by Sony Pictures), to call this anything other than a superhero movie is as laughable as Tom Hardy's attempt at bumbling comedy. Here he plays Eddie Brock, a VICE-like gritty street journalist whose video segments focus on taking down the rich, powerful and corrupt. Fixed firmly in his sights this time is the Elon Musk-esque tech mogul Carlton Drake (Rogue One's Riz Ahmed), whose determination to advance humankind routinely requires him to also sacrifice them in human trials. Drake's current focus is on four "symbiotes": amorphous sentient blobs from space who need to occupy a human host in order to survive our atmosphere. But Drake believes they also hold the key to humans being able to survive in space (which we'll need to do, because...global warming). In the course of his investigation, Eddie becomes entangled with one such symbiote (aka Venom), who wildly enhances Eddie's strength, speed and stamina, but also compels him to commit regular acts of extreme violence (mainly head eating) as they grapple to form some sort of symbiotic relationship. It's a device not entirely unlike the earlier Spider-Man villain Doctor Octopus, but even more so the recent Aussie film Upgrade, whose protagonist becomes infused with an AI that speaks to his subconscious and allows him to fight off hordes of villains whilst essentially watching on as a passenger in his own body. 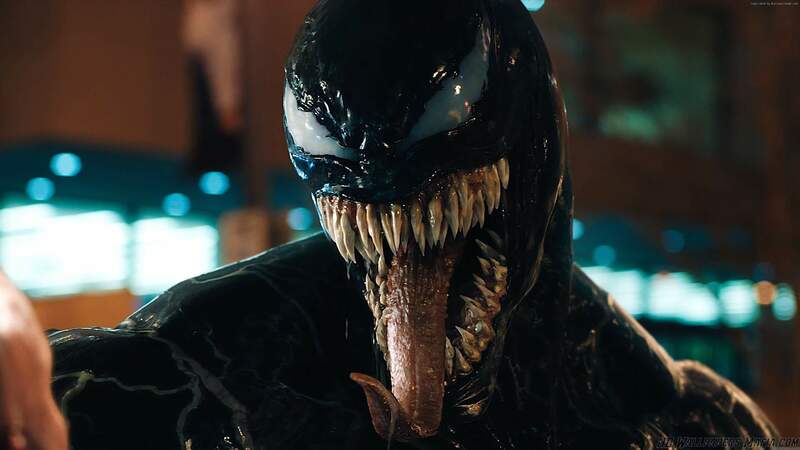 Directed by Ruben Fleischer (Zombieland), Venom flicks back and forth between violent battle scenes and mismatched buddy comedy, so much so that it never fully lands the vibe of either. It's almost as if Fleischer himself was possessed by a studio symbiote, one compelling him to make one type of film whilst he sought to make another. This incongruity is never clearer than in Hardy's misfiring performance as Brock, whose scratchy and stammering accent sounds like a half-baked Adam Sandler impression. Brock's presented as a hard-hitting journo one minute, then consistently called a loser the next – including by Venom. He's shown as principled and driven, then spends half the movie avoiding responsibility. He'll do whatever it takes, but often does nothing at all. The result is a character without an arc, ending the film – at best – somewhere in the ballpark of where he started. In all, Venom feels like an enormous squandered opportunity. Hardy is a juggernaut of charisma and physicality when given the right material, so to use him in this way is like using a prized stallion for birthday party pony rides. The same goes for his character's fiancée in the film, Anne, played by Michelle Williams. Decked out in the Spider-Man franchise's weirdly consistent tartan skirt and knee-high boots ensemble (seriously, what's up with that? ), she's a paper-thin character with almost no reason to be there. An actor of her calibre deserves far better. There's the inevitable teaser of a sequel in the film's closing moments, including the introduction of another terrific performer. It's possible that with the back story and setup out of the way, Hardy and the gang could cast off the origin movie shackles and properly go for it next time round. That's assuming they even get the chance, which is by no means a lock given Venom's disastrous beginning.